An 8-bedroom "single family residence" advertised as a vacation rental that comfortably sleeps 23. PREMISE — Since a 1968 Amendment to the state constitution, unless preempted, local governments have had the power to govern home rule. It is, therefore, their duty to regulate short-term vacation rental housing, and to protect the character of existing residential neighborhoods in the best interest of the community. Historically, local governments have been best equipped to develop and execute a comprehensive plan for their community based on the common desires of its citizens. Because in 2011 the state took away the right of cities and counties to regulate short-term vacation rental housing, local government could no longer protect existing residents from a commercial use within a residentially-zoned neighborhood when necessary. PROBLEM — Cities and counties were preempted and lost the authority to do their job in regulating vacation rental housing because the vacation rental industry disagreed with the choices of some communities. The restoration of partial authority in 2014 only further complicated the issue and enhanced the conflict. In 2011, the state enacted legislation composed by representatives of the vacation rental industry that preempted local governments’ pre-existing right to utilize traditional zoning or other regulations as a legitimate means to control the expansion of vacation rental housing when determined to be an incompatible use in an existing residentially-zoned neighborhood. This legislation was a result of a lawsuit brought by investor Steve Milo who sued the City of Venice over rental restrictions and won a $300,000 settlement. Realizing the disasterous unintended consequences, the Senate passed in 2014 by a vote of 37 to 2 a full repeal of the 2011 law. However the House at the urging of the Vacation Rental Industry, successfully diluted the effect of the Senate repeal. The resulting legislation did not include any zoning rights by local government, only more obscure means like number of bedrooms or occupancy which had to apply to all housing in a non-discriminatory manner. Additionally, the 2011 legislation that defined a vacation rental as a residence, not a commercial enterprise did not change. EFFECT — Incompatible short-term rental housing has adversely affected neighborhood environments statewide and impaired community stability. Short-term visitors and guests do not share in the responsibilities, obligations or concerns of local residents or others with ties to the community. The displacement of true residents both year-round and part-time by transient vacationers diminishes the critical attribute of neighborhood pride. The character of a neighborhood is drastically altered as it gravitates from a residential to a commercial use. The City of Anna Maria, a vacation rental friendly beach community in western Florida without existing rental restrictions has documented an increase in vacation rentals from 20% in 2011 to over 60% currently, with an increase of over 14% in just the last year. EFFECT — Short-term vacation rental houses are commercial ventures operating hotel-like businesses in residential neighborhoods and condominium communities. Florida law has determined short-term vacation rentals to be “transient public lodging establishments”, the same as hotels, inns, rooming houses and bed and breakfasts; however, as of 2011 they are also termed residences. Many former residential dwellings have been bought by non-resident investors operating through an LLC or torn down and replaced with the sole goal of creating a profitable business. These are often rented and operated by companies, which provide marketing, advertising, reservations, check-in/check-out, cleaning, and other hotel-like services. Without the same regulations, they gain competitive advantage over traditional lodging. Absent the power to control, restrict or prohibit this business from operating in established residentially-zoned neighborhoods, communities are experiencing undesired conversions and re-development of income-generating commercial properties. This can also create a public safety issue as these larger multi-person dwellings are not subject to the same fire and safety codes as commercial dwellings. In addition they place increased burden on municipal budgets to deal with a swollen transient population. 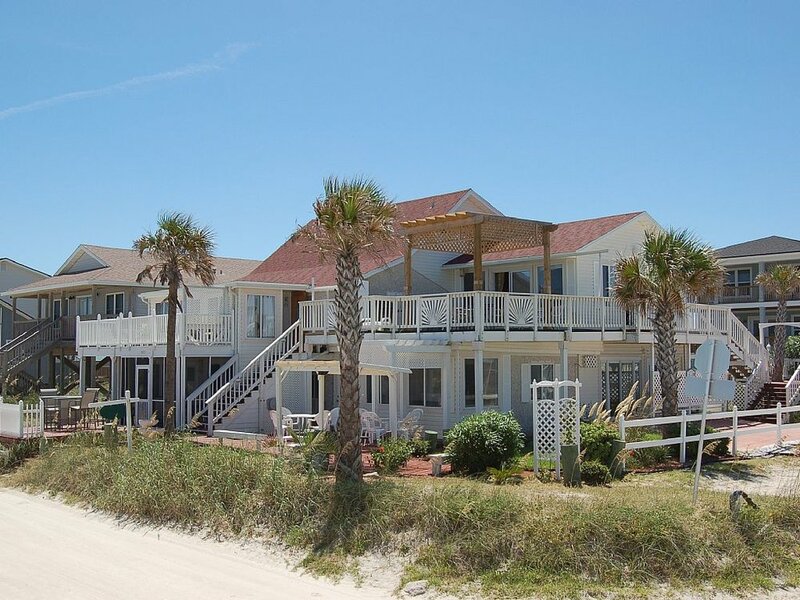 In Anna Maria City the average residence has 1.9 people and the average vacation rental has 8.5 people. An 11-bedroom "single family residence" advertised as a vacation rental that comfortably sleeps 18. EFFECT — The law exempting vacation rental housing from local zoning ordinances effectively punishes communities who had no previous problem with the vacation rentals. Current law grandfathers ordinances and regulations relating to vacation rentals which existed prior to 2011. If vacation rental housing did not previously exist in your community or vacation rentals were not a problem, it’s almost certain that your city did not enact ordinances or regulations to deal with this issue. As the law stands now, your community has little ability to restrict the use of vacation rentals or prohibit vacation rentals. As such, the community without prior regulation has become the “low-hanging fruit” as has been the case in the City of Anna Maria mentioned above. In addition communities with existing ordinances, like Longboat Key risk losing enforceability by enacting any change. Currently there is pending legislation in the 2019 Senate session that would remove all grandfathering effectively opening up all communities to development of short term vacation rentals. EFFECT — By exempting vacation rental housing the state created a privileged class that was not part of the due process and zoning that is the main function of local government. This encouraged widespread building of vacation rental properties in residential neighborhoods as a class of residence exempt from local governance. As with all civil matters concerning land use and zoning, short-term vacation rental housing is appropriately an issue of community concern and choice. By deviating from the principle of home rule, Florida opposed the entitlement of affected citizens, property owners and residents to be heard. While the vacation rental industry claims distrust for local government to provide lawful and equitable treatment, the existing law which was actually written by the Vacation Rental Management Association's legal firm prejudices the rights of anyone having a contrary interest. The impairment of property rights of homeowners affected by vacation rental housing are equally deserving of fair and just consideration. This is not possible under the provisions of the existing or revised statute, and the state needs to again trust local government to perform its intended role of allowing due process for all concerned. The initial creation of vacation rentals as a privileged class and the subsequent partial regulation by local governments has resulted in a host of Bert Harris claims as in $30M against the city of Anna Maria, $5.83M against Holmes Beach and $22.7M in Flagler County. Bert Harris claims arise from a private property owner's right to sue government for "taking" value. It should be noted that the vast majority of these claims only arose because of the state legislature's 2011 law that created the vacation rental loophole. However, most of these claims have been settled by means other than a monetary cost to local government. EFFECT — With the 2014 legislation, short-term vacation rental housing has been only partially regulated. The expanding vacation rental industry is not confined to Florida “resort communities”. Although residences in coastal beach communities and those in close proximity to major tourist attractions are prime targets, renting residential properties on a daily or weekly basis is a trendy investment opportunity in any community within reasonable proximity to a place of entertainment, recreation, sports, education, culture or natural beauty and surroundings which attract people. These are vacation destinations and exist virtually everywhere in our wonderful state. Florida encourages and embraces tourism, but some short-term rentals like this 7 bedroom house that sleeps 17 or this 9 bedroom house that sleeps 25 may not be appropriate for every community. With the advent of direct rental of "B&B like" housing, the trend of no regulation is expanding beyond just single family housing and into condominium/apartments dwellings though internet sites like Airbnb that can also affect permanent residential communities. Airbnb has publicly stated a desire to work with local governments while being on record of contributing $1.1275 million to state political campaigns for the 2018 election season. This includes $1 million to a PAC called People vs the Powerful and directly to the campaign of Sen. Manny Diaz who has introduced SB824 that would strip local government of all authority. CONCLUSION — The 2011 law exempting vacation rental housing from local regulation was a mistake and it has taken its toll by favoring the rights of new investment interests over existing residents and homeowners. This current effort also written by the vacation rental industry to revert back to 2011 must not be allowed to succeed. Allowing the uncontrolled expansion of vacation rental housing in existing residential neighborhoods should never have occurred. Most legislators who voted for the change in the law in 2011 realized that they made a mistake and attempted to a repeal immediately to limit potential claims of vested rights by investors in newly-created vacation rental housing. However, the legislation passed in 2014 in the interest of compromise did not end this unique exemption for vacation rentals and further complicated the situation. The state must reject the current efforts of the industry to revert to 2011 and restore the full right of home rule that allows local government to properly address this issue through zoning or other ordinances or regulations when such activity is determined to be detrimental to the community’s interest. Learn more by navigating via the buttons at the top of this page or go to YOU CAN HELP to send an email to the legislature.